Atelier Zuhra’s AW19 collection, Infinity, is rich with colour and meaning. David Yurman’s idea that “Gemstones have a beauty unlike anything else because they allow light inside and refract it” inspires a collection with both surface worth and deep value. Old school elegance infused with bohemian glamour draws power from the symbolism rooted in semi-precious stones. While not aiming for revolution, Atelier Zuhra revisits couture with a curator’s eye, selecting only the most precious textures and metaphors for this new collection. Each colourfully ornate piece has been crafted to tell a unique story, keeping in mind the nature and meaning of the stone inspiring every item. Tulle and organza build out the collection in an array of vivid hues that confirm brilliance and authenticity tied to each of Atelier Zuhra’s meticulously crafted garments. Ruby reds bring courage, life, and passion to the runway, while citrine yellows underline new beginnings. With a fresh start and sparkling resolve, Infinity guarantees the resonant colour carries meaning. Green emeralds embrace love, re-birth, and fertility. Blue Sapphires remind us of the power of honesty and trust, while purple amethyst offers protection and healing. The aesthetic of the collection lies in its ability to thrill. 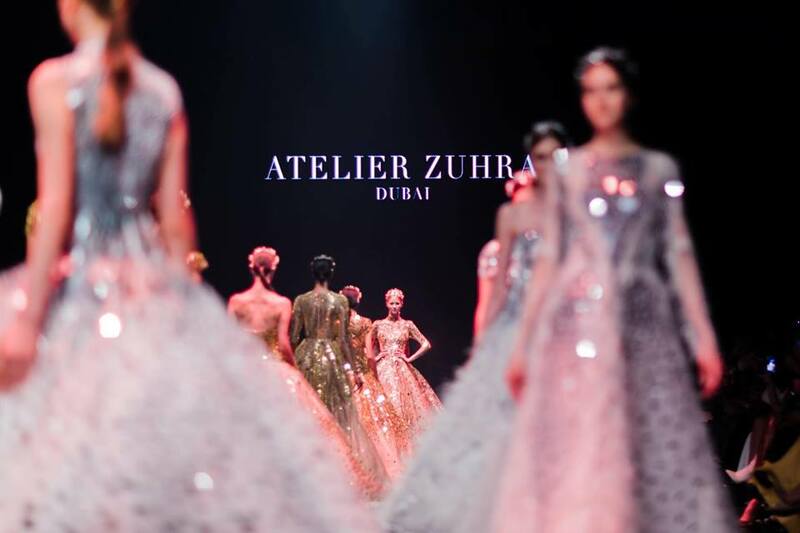 While undeniably beautiful and luxurious, Atelier Zuhra’s timeless designs will mean something unique to each of its viewers.